Genuine care given by a loved one is as precious as gold. 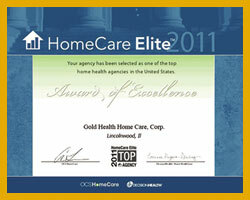 We at Gold Health Home Care Corp. believe so, too. 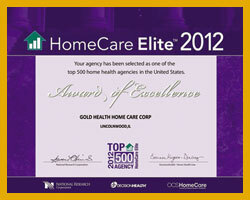 This is why we are included in the Home Care Elite list. The comfort of one’s home has healing values. A person suffering from a certain illness has been known to recover faster when cared for in his or her own home than someone who is trapped in a medical institution. Our team of highly efficient health care professionals are above those in the industry as they go out of their way to make patients feel cared for and loved. Our team treats all patients with loving care, without prejudice or discrimination. 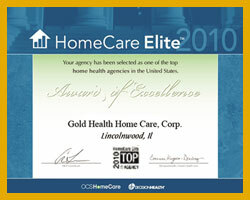 We provide a holistic approach to home health care. We deliver high quality nursing care and health services with dedication, commitment, passion and genuine concern for the well-being of our patients. 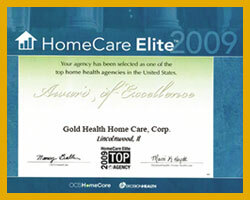 At Gold Health Home Care, we provide home health care that is as precious as gold. "Thank you again for your consideration and care during my mother's illness. You and your staff were wonderful with her and tremendous support to me and the rest of the family. Please extend my thanks to all."